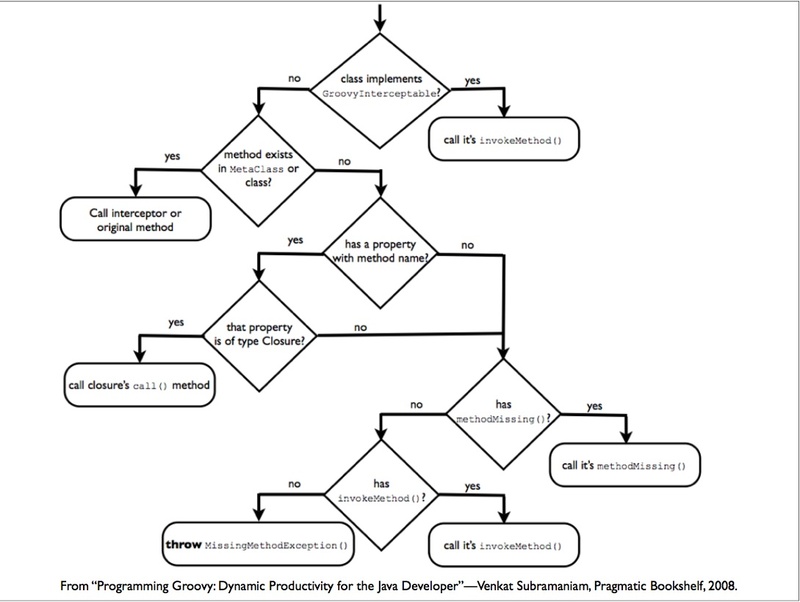 Let's cut to the chase: Groovy Programming by Venkat Subramaniam is a great book. The audience is skilled Java developers. Java is the baseline. We don't need an explanation of String, or ArrayList, or any of the Java types. We don't need reams of pages on what closures are. This book launches right into why Groovy improves Java, rather than dwelling on how the syntax works or what the library methods are. The presentation work great. It's a Pragmatic Bookshelf book, so it's gonna be an easy read. Whitespace, font size, margins, text to graphics ratio; the Prag team knows how to make a trade paperback inviting and easy to read. Maybe you've never thought about this stuff before, but look at a Prag book side by side with another publisher and you'll see my point. Another thing, this book thankfully has no fictional personas you follow through the life of a project. I hope they've retired this style for good. 100 pages on meta-programming. What more do you need, someone to hold your hand and show you all the current techniques? Oh wait, that's what this is. The pacing and chapter choice are excellent. Each chapter is standalone and would make sense whatever order you read them. Skip right to "Working with XML" if you want then read the rest of the book in order. However, the book took me less than 10 hours to read, so you'll get there quickly reading linearly too. It's still a good reference. When writing Groovy code, I've reached for this book twice in the last three days instead of going for the usual Google search for help. There are a ton of examples and I find myself saying, "I know this is possible, let's check out how Venkat did that." The book does a great job balancing quick explanations of concepts, code examples, and insights into the implementation of Groovy. Even in chapters on topics I'm familiar with, I found myself impressed with everything Venkat found that I hadn't seen before. So the book is great, now let's talk about edge cases. Did you know the semi-colon is not always optional? The last line before an instance initializer block will require one or the interpreter will think you're trying to pass a closure as a parameter. Oops! Think invokeMethod() is called before every method call? Only if the object invokes GroovyInterceptable. The method dispatch chart is sweet if you're into these weird, complex rules like I am. Think all classes have an ExpandoMetaClass? Actually, none of them do (at first). EMC is one possible implementation of metaClass, and by default objects have a MetaClassImpl, but once the metaClass property is read, the underlying implementation gets switched to an EMC. Wow, crazy. I have a feeling this will be fixed in the future. Here's an edge case that is useful to know about: Stubs and Mocks do not intercept constructor calls. So when you mock a FileWriter (which takes a string parameter on the constructor and creates a file with that name within the constructor), you'll find that your file system actually does have files getting created on it. Can't say I've ever had a test fail because of that, but it is good to know! I'll leave you with another quote I can't attribute. Someone commented once that Ruby doesn't have a Ruby Puzzlers book because it would be 10,000 pages long. Maybe the same can be said about Groovy, but it's no bad thing. This book is filled with cool, puzzling language tricks. That's part of the fun! And this book is a fun read too... it'll be on my shelf Monday so stop by my cube and borrow it for a few days. I'm about halfway through with this book right now and I'm really enjoying it. So far I think it's a better book than the Groovy Recipes book (at least for me, that one feels more introductory). The two big sections that I felt were missing from Groovy Recipes were a section on using groovy for testing and a section on using groovy regular expressions. Programming groovy has both of these though I'd like to see even more on some regular expression patterns, something I think that the ruby world puts a lot of emphasis on in the pickaxe book and in The Ruby Way. I'm looking forward to digging into the meat of the MOP stuff. So far, I'm liking this one as much as Groovy in Action and it's more current as well, which would likely make this book my default "first" book to recommend to people picking up groovy.